Polysafe concrete blocks were recently selected by Europa Worldwide Group, a privately owned Transport and Logistics company. Europa Worldwide Group contacted Polysafe for the supply of concrete blocks to be used as stop barriers. These were to be placed in front of trucks to prevent driveaways while being loaded or unloaded, across three separate sites around the UK. 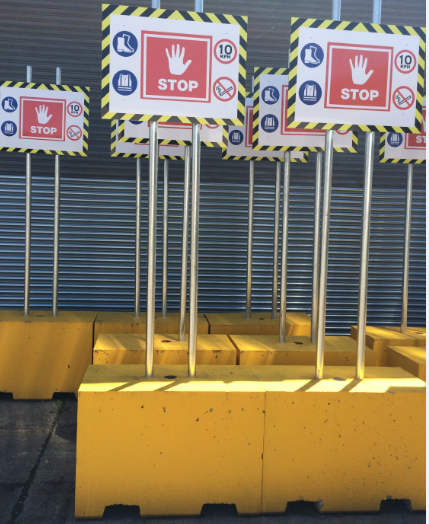 Type D barriers were specifically used and painted yellow, with two galvanised steel poles cast into each block for Europa to attach their own health and safety signs to them at lorry cab height. Our blocks are manufactured to the highest of standards in a range of sizes and variations to suit your needs. For more information about hiring or buying Polysafe concrete barriers and blocks, please call 01778 560555.